We jammed a bunch of Halloween activities into a couple days this year. 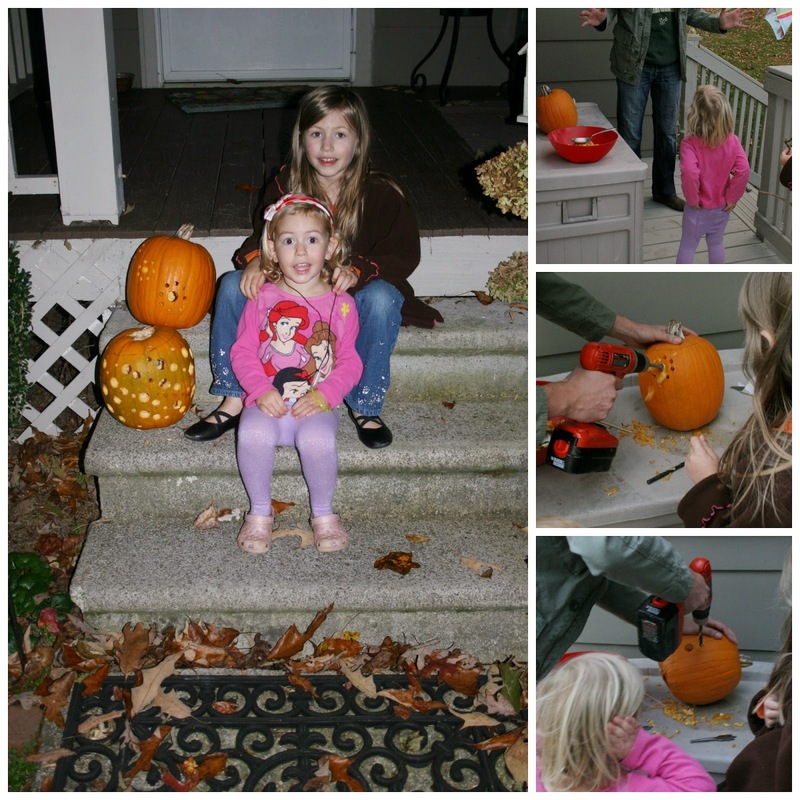 First, on Wednesday, we finally carved pumpkins. We used the pumpkins we inadvertantly grew in July. One had a hole in the bottom, but that was fine, since we used a drill to do our jack-o-lantern designs this year anyway. I had to do some sewing on Wednesday night to prepare Cadie's Tinkerbell costume (the dress was done for the birthday party back in August, but we needed a little cape like the jacket Tink wears in The Secret of the Wings). 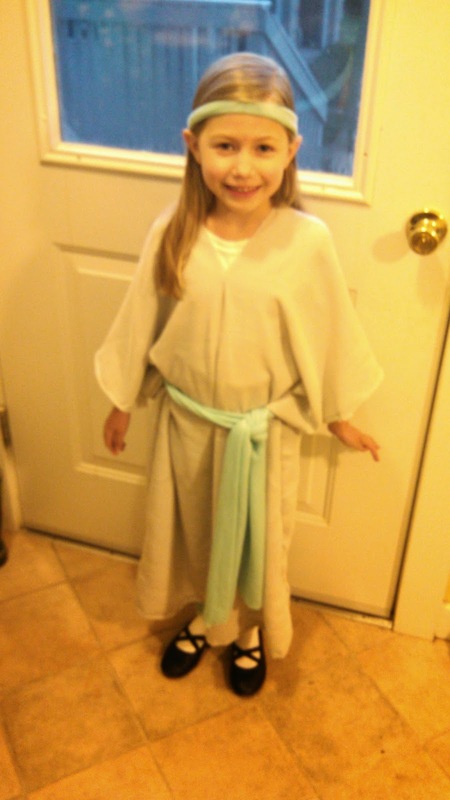 I also had to sew her Deborah costume for All Saints Day at school, which they celebrated Friday. Trick-or-treating was Thursday night. All the little campus kids get together and go to faculty homes and dorms. If you ask them, the best part is riding on the big kid school buses to get everywhere. Here's some of the crew waiting to head out. one of friends' families was two penguins and Antarctica! I made that Belle dress too! Our buddy E borrowed it! The girls were happy with their costumes. 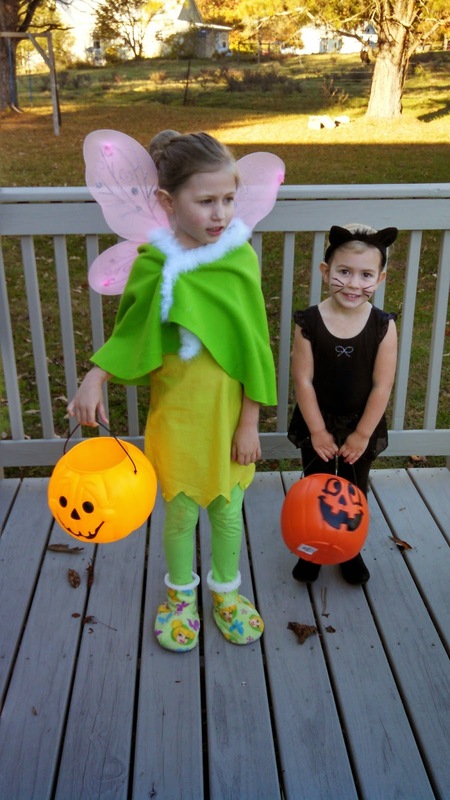 Cadence knew for months that she would be Tinkerbell, but Piper kept changing her mind before settling on a "puma cat." She learned about pumas on Go, Diego, Go! and has been telling people facts about them. Finally, here's Cadence in her Deborah costume, ready to go to school on Friday. Busy time making all those costumes! They are all wonderful! I recall making one biblical costume for you when we lived in Tallahassee. Fun days! Good job on the Debra costume! Sweet girls, happy smiles. Enjoyed the pictures. Oh! I love the Tinkerbelle cape and you'll have to show me how you made the Belle Dress later. Good job on all sewing projects.